I have been raving for two years now about the amazingness of Ann Voskamp's book, One Thousand Gifts. I read it with my book club over several months and I thought that its message of gratitude and finding the joy in the ugly beautiful had oozed into every pore of my dry little heart. It only took a revisit to the topic in our weekly Bible Study (this time with the video series along with the book), a roller coaster ride through a tumultuous situation, and a revealing text conversation with one of my kindreds, Sarah, to shine the light on my ignorance. I would like to think that I "live what I believe." Yes...I would love to think that. But what I have come to see in the last two weeks is that it's much easier to spout off a philosophy than to actually live it out. When push comes to shove, or that roller coaster screams through the station and goes around for yet another lap, I am finding what I truly believe. 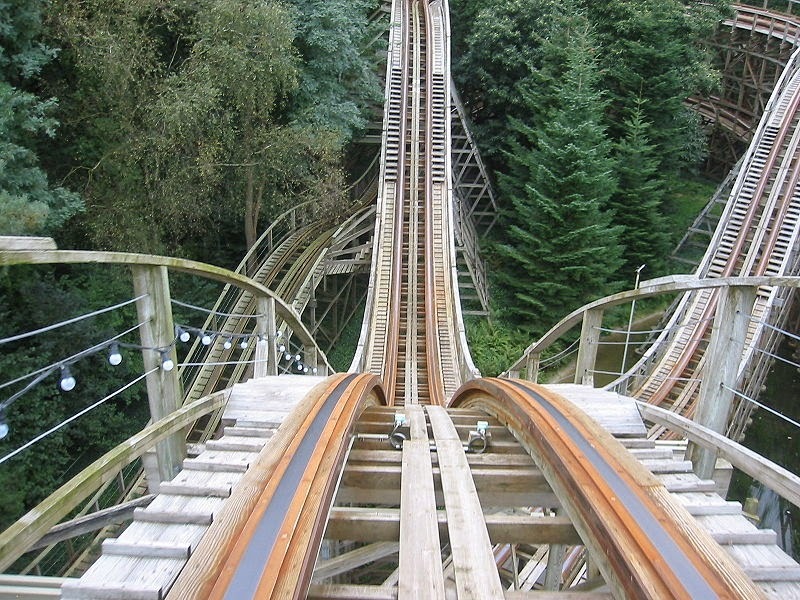 While roller coasters are thrilling and breath-taking and are a lot of fun to shriek and be terrified on for a few moments, no one really wants to ride one for any serious length of time. The "fun" wears off eventually and what once gave you "tickle bellies" on those huge drops now just makes you want to throw up. I would love to think that I am always up for an adventure...that God could throw down a challenge and I would eagerly embrace it...that I would move through said challenge with poise and grace -- a shining beacon of an example to all who know me. Instead, I feel like I am losing my mind. Or at the very least, a measure of my faith. I am incredibly disappointed to discover that I'd rather watch someone else ride the roller coaster of life with poise and grace and admire it from the sidelines. Because, I thought I would be the one with my hands up in the air hollering with delight at the ups and downs and encouraging people to get on. Because the truth is that despite all of my talk of loving change and getting out of the rut, apparently safe and the same suits me just fine. Last week, I posted about how after a long wait in a very small house (by American standards, mind you), I felt like it was finally God's timing to move us to something else. We had been patiently (okay...minimally patient) waiting for God's yes -- waiting for a better market, a better financial situation and just waiting because it felt like He was saying to just wait. We moved out in that faith by putting our house up on the market so that we could place an offer on a house we loved and then lost. And that was sad. But we were still selling our house. We would get a chunk of change out after escrow and then find our dream place. We had two viable and strong offers. We took the highest and best. They signed...and then changed their mind the next morning. So now we have no offers. Our showings have slowed to an anemic trickle. Half of the stuff we removed from our house is in my parent's garage and the other half in is ours. I'm homeschooling out of a plastic crate and I can't find anything. I lose my business every time a child lays something down out of place in my "show-ready" house. This quick sale and transition to something else seems to have turned into a game of Monopoly and I feel like I am not passing Go or collecting $200. In fact, I feel like I am perpetually in jail with no get out of jail free card available. Did I mishear you God? What lesson am I supposed to learn here? Oh wait...the one where I say I believe what Voskamp penned about "all is grace," but then throw a huge hissy fit when you don't do what I want you to do and grace seems like the last thing I'm feeling from you? Yesterday at Bible Study, I was reminded by sweet Ann that stress is really a form of disbelief -- "practical atheism" she calls it. And she's right. How can I feel physical stress in my body and disquiet and unrest in my spirit if I truly believe that all is grace and that even in my crazy coaster ride, that God is calmly and carefully operating it. Is it possible that I could throw one of my hands up over my mouth and raise the other high in the air -- the universal roller coaster riding sign for, "I want off this thing!!" Get off the roller coaster, you say? I could actually do that? I don't have to sit there and submit to the suspension of gravity through the loops and corkscrews? I may not always be able to choose whether this ride through life goes from sedately cruising in a slow boat of "It's a Small World" to the heart pounding drop of "Goliath," but no one every said I have to stay on it indefinitely. The choice to continue to ride or get off is mine. So today...I make another choice. I refuse to live in fear and the nausea of practical disbelief. I choose to let go of my pre-conceived idea of what this ride should look like. I choose to let go of my notion that winners never quit and quitters never win. I choose to not make this ride about me, but to make it about Him. I choose to get off, grab some cotton candy, and enjoy a stroll along the boardwalk of life with my family. Because I'm reminded once again...it's not the house, but the home you make inside of it.